Founded as a nonprofit organization based on Quaker values, we are a vibrant, diverse, inclusive, caring community focused on healthy aging. We support individual lifestyles by promoting independence, continuous learning, engagement in and service to the wider community, social and intergenerational relationships and excellent health care. The first residents of Kendal at Oberlin moved in during October of 1993. But plans to bring a retirement community to Oberlin began many years before that. In 1987, a group of Oberlin citizens decided to investigate the possibility of building a retirement community in Oberlin. After exploring a number of communities across the country, the group persuaded The Kendal Corporation (Kennett Square, PA) to “develop, market, arrange for financing and construction, and to own and manage Kendal at Oberlin.” Kendal at Oberlin now has its own independent Board of Directors, with The Kendal Corporation as a supporting partner. This relationship offers flexibility to meet the needs of our local community, as well as all the benefits of a multi-unit operation. 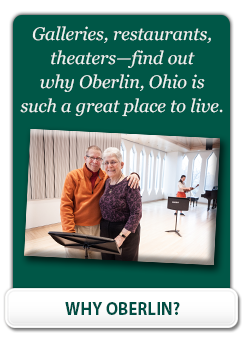 Today, Kendal at Oberlin is a life plan community serving over 325 residents and is a hub of activity for older adults throughout the community of Oberlin. Residents have moved here from 36 states and the District of Columbia. Kendal strives to serve the greater community as well, with fitness center classes open to community members, the Kendal Early Learning Center, and programs like Kendal at Home. In 2017, Kendal at Oberlin staff and resident volunteers recorded over 62,000 hours in volunteer service the greater community and to Kendal. To learn more, visit our Community Benefit page. The Values and Practices established by The Kendal Corporation are based on Quaker values and form the foundation of Kendal at Oberlin’s approach to serving older adults in northeast Ohio. With emphasis on resident governance, community engagement, an inclusive culture, a commitment to lifelong learning and excellence in health care, Kendal at Oberlin is a dynamic and exciting community in which to live and work. Stay connected with Kendal at Oberlin by signing up for our weekly e-newsletter, or by using the form below to request a brochure. To review Kendal at Oberlin’s financial information, download our Disclosure Statement. To learn more about The Kendal organization, here is the link to The Kendal Corporation’s Annual Report.